Aschmidt reopened T190841: Allow for conditional field mapping in Citoid as "Open". I am sorry to say that the issue has come up again on Geman Wikipedia, so I have reopened the task for re-evaluation. @Cirdan has made a good point in describing the issue and the solution for dewiki above. In the meanwhile @Crazy1880 pointed out to an entry in OCLC that of course does contain the OCLC number, but not an ISBN. In German-speaking countries we rarely refer to OCLC ids. Also, we rarely use WorldCat, we prefer the catalogues maintained by our national libraries that issue ISBN and ISSN for German-language publications. So, I subscribe to Cirdan's description and I would be grateful if you please could change configuration accordingly. Aschmidt added a comment to T216456: JSTOR is blocking citoid IPs. Just to make sure: This worked before, and it only happens in JSTOR, no other resource is affected. I did not change anything about the local configuration. Aschmidt updated the task description for T216456: JSTOR is blocking citoid IPs. Aschmidt created T216456: JSTOR is blocking citoid IPs. Aschmidt removed a watcher for WMF-Legal: Aschmidt. Aschmidt added a comment to T193728: Address concerns about perceived legal uncertainty of Wikidata . Copyright has to be about some concrete expression. But law is a matter of quality rather than size. of entities none of which can claim any meaningful exclusive right. especially because it's so small (few hundreds data points). facts can be used by anyone (beyond private life one). Please note that there is not one copyright law. There are as many copyright laws as there are legal systems Wikipedia and Wikidata content can be retrieved from. Aschmidt updated the task description for T193148: How does the GDPR affect Wikimedia sites and Wikibase instances?. Aschmidt added a watcher for WMF-Legal: Aschmidt. Aschmidt added a comment to T184467: CodeMirror in 2017 Wikitext Editor shows overlapping text in Firefox. @Esanders I have restarted Firefox on El Capitan with a fresh profile, and I have switched off auto hypenation on Meta Wiki. No changes, I'm afraid. :( Strange that it seems to work for you... Again, thanks for looking into this! Here is an example of what it looks like with me. Because of the recent renaming of this task by @TBolliger I'd like to point out once again that this is not only an issue concerning Chinese text, but also latin scripts and fonts. Aschmidt added a comment to T97936: Allow user to switch cite template in limited circumstances. I second the suggestion to introduce a switch for the template an author deems fit for a citation. I can confirm the issue with Firefox ESR 52.5.3 under El Capitan on German Wikipedia, i.e. no Chinese fonts, but monospace, viz. Courier. It first showed up right after T175223 was implemented. I am sorry that I didn't have the time since then to open another task. As was mentioned before, I have also found it helpful to toggle syntax highlighting, or to undo an edit in order to get rid of the blurry fonts. Also, it seems to make a difference whether you start typing underneath some text, e.g. 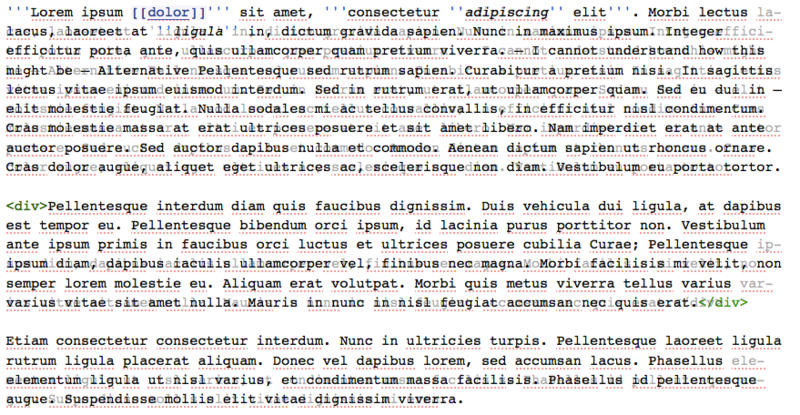 on a talk page (more apt to show the fault), or whether you start editing in the middle of a text. Aschmidt reopened T175223: Selecting syntax-highlighted text in the 2017 source editor covers it completely when using Firefox on OSX as "Open". I forgot I also have to change the status of this task in order to have it reviewed again. Aschmidt added a comment to T175223: Selecting syntax-highlighted text in the 2017 source editor covers it completely when using Firefox on OSX. Shortly before I pass into the weekend I would like to thank you for applying the fix I requested. Aschmidt added a comment to T95702: Be able to use the auto-cite tool to insert a citation template outside of a reference. In fact this has already been secretly implemented on July 2017 and it worked then (I checked Greek and English Wikipedias) but now is withdrawn. The more I work with VE and the new wikitext editor the more I get used to tools like citoid. For the time being, I switch from VE for creating a citation to wikitext for removing the ref tags in the Further Reading section. I think the suggestion by @ManosHacker would be a good idea to start with. I suggest to raise the priority of the task because it is really important to expert authors, as @Sadads has already pointed out. I have opened a discussion on German Wikipedia. Aschmidt added a comment to T87217: Make OTRS sessions IP-address-agnostic. This is just to let you know that I can confirm that—for the time being, at least—I have been able to use OTRS with IPv6 disabled in Firefox, or in OS X Mavericks, for that matter. Today, I have got the advice to set network.dns.disableIPv6 in Firefox about:config to "true". Please note that the case of dual IPv4/IPv6 addresses is indeed one main problem we reproduced some weeks ago in issue T88224 which was soon closed and marked as a duplicate to this ticket. Such broadband connections are provided per default in this country. I just would like to say that some of us have not been able to work in OTRS at all, including myself. I keep being logged out after some minutes, on some occasions after a few clicks, while the scenarios you are discussing are rather hypothetical, if I may say so.